It’s an on-going debate in the wedding world: do a first look or be traditional and see each other for the first time at the end of the aisle. To be honest, when I started out in the weddings, I was Team Traditional. Now that I’ve witnessed over 40 first looks and been a part of almost 100 weddings, I’ve changed my opinion and am now Team First Look. Below we’ve listed our top reasons we are all about first looks! Joey and Mallory got all their pictures done before their wedding thanks to a first look and their photographer, Taken by Tate. We have 5 solid reasons why we think you should consider a first look! You have more time to party! Why? Because with a first look, you get 99% of your pictures done before the wedding. After the first look, you can start to do family pictures, wedding party shots and couple portraits prior to the ceremony. Often photographers can knock out all pictures and after the ceremony you can head straight to your reception. This means your guests don’t have to wait as long to eat and you get to spend more time at your reception. Often with a first look, our couples will go out for sunset shots to get a few bonus pictures in. Also, for the Fall & Winter months you don’t have to have such an early ceremony time if you do a first look because you can get your pictures in when the lighting is still good! Doing a first look when your makeup & hair are freshly done means your pictures will be at their best and you’ll quite possibly love them more! If you wait to do your pictures after your ceremony your makeup & hair might be a little worn from the tears or weather during the ceremony (think wind, raindrops, heat) and may not look as sharp as it did two hours before. You get some quality time with your future spouse in the hurry of the day. Some often worry that a first look will deter from the emotion of seeing each other down the aisle. Trust us, it doesn’t and we have pictures to prove it! Below are some of our grooms that DID a first look! First looks give you and your future spouse some alone time in the hustle and bustle of the day. Some have said a prayer, read a letter or exchanged gifts. However they chose to share the moment, each and every one of them treasured the moment together, quiet and private. The moment is full of anticipation, surprise, happy tears and laughter. To us, a first look is the true depiction of the relationship, a moment at it’s most sincere, a time without the nerves of having an audience. All our couples said doing a first look gave them a sense of calm that helped ease the butterflies before the ceremony. You share a private moment that you will forever treasure and get some of the best pictures. Take a look at some of these first look photos. You can see that these couples are so in love and share such a happiness between them. The pictures capture so much and no doubt these are some of the couple’s favorite pictures. We know they are always ours! We love when the couples share a goofy, playful or laughter-filled moment together. Some get so wrapped in the moment that clumsinenes happens but that’s ok, that’s what the best memories are about. Spontaneous, unscripted moments. You get to share the hours before the ceremony with your favorite person on earth as opposed to being kept from them! While you are doing pictures and right before the ceremony you are with your person. Weddings are busy and heavily scheduled events with lots of interruptions. Couples tell us that having this time together made the day slow down a little. First looks give you more to enjoy the day and remember it together rather than comparing notes at the end of the night when you are exhausted. Often at receptions, couples are pulled between guests, moments like first dances and cake cutting and sometimes one is on the dance floor while one’s conversing with guests. You’d be surprised by how little time some couples get to spend together at the reception! Doing a first look protects your time together. 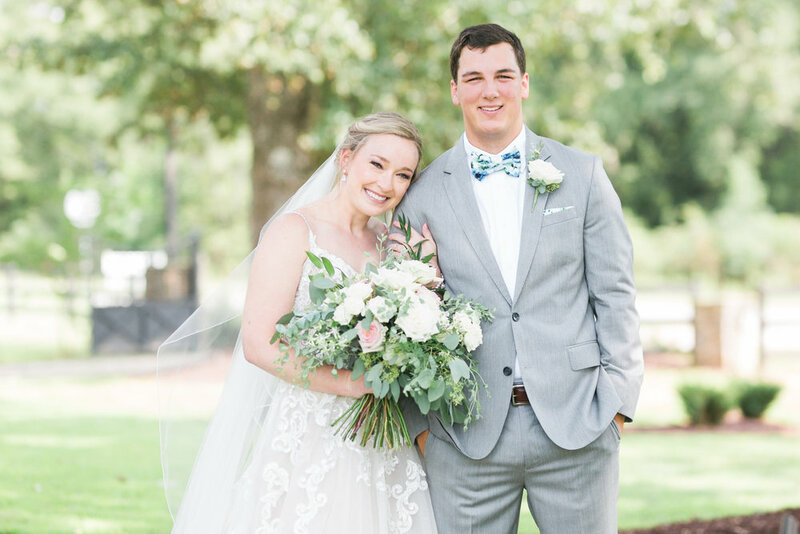 Haley & Trevor’s first looks are pictures we will never tire of! Thanks to Mandee Matthews for capturing their perfect day! Standing strong with Team Traditional? Are you Team Traditional and NOT wavering from that stance? That’s ok, we understand. If you or your family can’t imagine the idea of seeing your partner before the walk down the aisle consider having a first look with your Dad, grandfather or bridesmaids. We had one bride that did a first look with her son before he walked her down the aisle. It was truly one of the most special moments we got to witness. Choosing whether or not to do a first look is a very personal choice between you and your future spouse. Do what feels right to you and try not to let the opinions of others influence your decision. Remember, it’s your wedding day and it’s important that it plays out the way you imagine it. When you do decide, there is one person you must tell….your photographer! A first look changes their timeline (therefore the timeline of your day) so it’s important to give them advance notice. That way they and the other vendors of your day can be sure they are all in the right spot at the right time! We can also protect the private moment and keep peepers away! Tell us are you #teamfirstlook or #teamtraditional? Do these tips persuade you to change teams? We’d love to know!